For the first time in a few years I am hosting an Art Swap once again! I started hosting swaps way back in 2002, but when we moved in 2012, I simply needed to take a break. Steve & I had moved house a number of times, my dad had passed away and I just needed to pause and take a break . . . I wanted to try some paints I'd heard about that would be good to use with the gelli plate, because they were a bit slower to dry than regular acrylic paints. But before I started playing with my Gelli Plate with them, I tried them out in my very small moleskine journal. The new paints I ordered are Golden High Flow Acrylics . . . I'm filling up my tiny moleskine journal fast - it's only got a few blank spreads left! For the "We ❤ Mail Art" group (that's me, plus my friends Julie Welch & Jo Urbani) - our October mail art theme was Song Lyrics. It took me some time to decided which song to pick for my inspiration, because there are so many to choose from. I listened to a lot of Pandora while driving and auditioned many a song . . .
A mono print sent to me by my friend Diana Kovacs - inspired Lumiere paint next to it! -In my moleskine journal. It won't be long before it is filled up! It is magical how quick and easy it is to work in this little journal . . .
After a couple of weeks of not working in my journal, I got started with a page of leaf prints I made on deli paper last week. I really wanted to add some of these prints to my small moleskine journal, sized 3.5" x 5.5". It is really quite small . . . . I realized today I had shared my latest Animoto video in a couple of places -on Facebook and Blipfoto, but not on my blog! The story is, my husband Steve came home last week with some wild looking leaves that had been eaten by insects. He and Dave Lucas had picked them up outside the boatshop. Dave said, "wouldn't Lenna like these for stenciling or something?" . . . .
More happy pages from my moleskine journal . . . the small size: 3-1/2" x 5-1/2" makes it so easy!! The new pages start with something wonderful, a collaborative effort with a special friend. His name is Sam Wade Sears, or "Red" as we call him; a real renaissance man. He has had so many experiences and amazing stories to tell! He helped build the Grand Coolie Dam as a 17 year old youth and was a merchant seaman during World War II, in both the Pacific and Atlantic. He marched with Dr. Martin Luther King! - Red is a friend of Lucas Boatworks (where Steve does all his projects) . . . I find myself returning to my small moleskine journal, again & again, page after page! The 3.5" x 5.5" size means it does not take a lot of time to complete a spread and it is fun to do. While I was gone in Boston Steven surprised me by drawing a cartoon of our cat Lightning, scanning it & emailing it to me! Steven is an excellent cartoonist and it was such a treat to receive this when we were apart. It made me laugh!! When I got home I framed the original drawing, as you'll see below. I also found his "practice" drawings in my studio . . . .
❤ I brought my small moleskine journal with me when I traveled to Massachusetts just because I thought I might have down time. I did! The first three photos below were taken on the plane . . . I did some traveling at the end of September 2015, so I've been away from posting and took some time off. I traveled to Boston and saw both of my sons and their wives, a treat. I find traveling a bit hard, especially when going alone -but Steve opted to stay home & take care of the pets . . . it's hard to get him out of Florida these days! First stop was to spend a few days with my youngest son Dallas and his wife Liz . . . I've been showing up to work/play in my art journal(s) more often lately, which has been so good for me. About 2 months ago I found that a more structured journal prompt was just not inspiring me as it once did and I was struggling. Feeling bad. When I gave myself permission to give up those prompts and work on my own, I instead felt myself sail forward . . .
something fishy going on . . . Yes, something fishy is going on! I went back to working in my larger 9" x 12" Dylusions journal. ;o) I did this because the other morning I went on an "artist's date" with myself, to a local art store in Bradenton. There, I found the most interesting handmade paper. I am sure I will use it for other things, but as soon as I saw it, I immediately thought I wanted to use it in my art journal! I cut it to page size . . . The difference in size between my larger 9" x 12" Dylusions art journal and my 3-1/2" x 5" moleskine journal . . . I continued working in the small moleskine art journal last week and covered a spread of pages with fabric. I love this small size after working larger. They each have their place, but after a year of working in a bigger area, it's fun & refreshing . . .
My friend Julie Welsh (aka Jewels) saw a video of my art journal spread recently and told me she loved it. 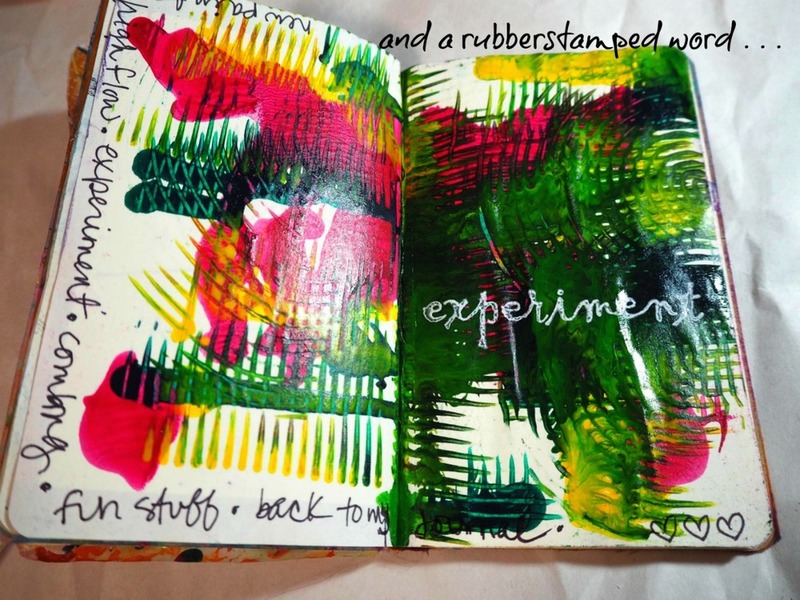 She remarked she had "lost steam" with art journaling, but hoped to do a page again soon. Having been through that myself, I quickly replied and said, "When you feel like doing something creative again, grab your journal . . .